Early in the morning on 26 July 1971, the good ship Endeavour, and its crew of three - myself, Al Worden and Jim Irwin - departed Earth-space for the Moon with the lunar module Falcon in tow. Once on the lunar surface on a plain nestled at the base of Mount Hadley in the Apennine Mountains, and near the eastern rim of a sinuous rille, Jim and I were to unstow Lunar Rover-1 and use it to explore the site. It was to be the most demanding Apollo mission to date. How ''we'' (all 400,000 people working on the Apollo programme) prepared to fly to the Moon was so complex to often be almost overwhelming - flying to the Moon and returning to Earth (successfully that is) is very, very difficult. So, just how did we plan and prepare Apollo to fly to the Moon? A: Adopt a method by which men could fly to the Moon and return safely. B: Build the spacecraft and ground facilities to implement the method. C: Create the techniques and procedures to operate the spacecraft and ground facilities; train the flight crews and ground crews in the use of these techniques and procedures; and most importantly develop a 'flight plan' to establish the precise sequence of all of the mission activities. In May, 1961, after President Kennedy had challenged America to landing a man on the Moon and returning him safely to Earth, NASA soon defined three methods of achieving this objective: (1) direct ascent from the surface of the Earth to the surface of the Moon; (2) rendezvous of all of the elements in Earth orbit and then direct to the lunar surface (EOR); and (3) rendezvous in lunar orbit (LOR). In November 1962, 18 months later, LOR was announced as NASA's decision. Thus 'rendezvous' became the key to the method, though it appeared perhaps the most hazardous option at the time - we had not yet even attempted a rendezvous of any type, even in Earth orbit (the first would not be for 3% more years), much less during an orbit around the Moon, 240,000 miles [400,000 km] away, where, on the far side, there was no ground tracking or any contact with MCC. But the LOR decision drove the design of the entire lunar landing 'system' - spacecraft (hardware and software); ground facilities, and especially the resulting complex flight operations, techniques and procedures. To illustrate the necessary complexity of this method, we were to fly ten distinct phases of the mission, each phase operating in a different domain: (1) launch from Earth; (2) Earth orbit; (3) translunar (and later trans-Earth); (4) entry into lunar orbit (and later departure from lunar orbit); (5) operations in lunar orbit; (6) descent to the surface and landing; (7) surface operations; (8) lunar ascent; (9) lunar rendezvous; and (10) Earth re-entry. To traverse these domains, nine different 'vehicles' were designed and built - three stages of the giant Saturn V launch vehicle; four spacecraft modules (command module (CM), service module (SM), descent stage and ascent stage of the LM)); and on the lunar surface, the lunar roving vehicle (LRV) and the spacesuit and its backpack with oxygen, cooling and communications. Each of the four spacecraft modules required several systems - operating, support, and supply - including specific combinations of guidance and navigation (G&N), electrical, communications, control (rockets), environmental, sequential (pyros) and consumables (propellant, water, cooling); and each system itself consisted of several subsystems and a myriad of components. (today's mobile phones have 2 billion words!). These essential systems had 25 modes of operation (automatic, semi-automatic and manual - for both prime and backup systems), using a total of 51 rocket engines of five different types - all of which had to be operated at precisely the correct time (the flight plan) using precisely the correct procedures and 'mission techniques'. And simultaneously with the spacecraft, the ground 'systems' were designed and built, including a worldwide network of tracking and communications - and especially the MCC in Houston. The very complex and capable MCC in its broader sense was like a spider's web - consisting of a central hub with ever-expanding sequential 'rings' and connected through nodes like spokes on a wheel - each node was, in its own way, a 'mission control centre', and was manned by the true experts in that particular area of discipline. The hub of this network was the mission operations control room (MOCR). Within the MOCR, the flight director supervised 14 different operating positions, or consoles, each of which was manned by one or more flight controllers (44 total active personnel during the first shift of Apollo 15). Backing up these front-line operators was the first ring of 15 'back rooms' (staff support, computer, science and communications rooms). These in turn were supported by direct links to the next ring, which comprised the other NASA field centres as well as the prime contractors, who in turn were connected to their particular subcontractors in the next ring, who in turn were linked to component suppliers and other supporting operations and elements at the outermost ring. This vast assembly of systems, subsystems, components, astronauts, flight controllers, support staff, and the like, had to be tightly integrated and they had to play in harmony - just like a 100-piece orchestra. Everybody had to be on the same page, the same line, and the same note; or there would be no music. Two concepts were key to preparing this orchestra: (1) mission techniques; and (2) crew procedures. Mission techniques. Of special significance during Apollo was the conductor of this orchestra - someone who could bring all of the instruments together, read all the music and communicate with all the 'players', someone who could lead the vast Apollo team in its preparation for the missions. One of the key figures in NASA management, whose contribution was absolutely crucial in making sure that communication between all parts of the Apollo 'orchestra' worked in close harmony, was Howard W. Tindall, Jr, the Chief of Data Priority (otherwise known as 'mission techniques'). Bill Tindall's unique ability to get people talking and communicating clearly and openly became vital to actually using both hardware and software right across the board. His meetings were always very lively discussions, where firm decisions and commitments were made on the spot. These meetings were highly technical, deeply thought, with often very tense debates. For one of the big meetings, there were as many as 100 engineers, managers, astronauts, flight controllers, contractor representatives and other essential players. Tindall himself summarised the essence of these meetings: ''In short, the primary purpose of these meetings was to make decisions, and we never hesitated!" Bill Tindall's way of summarising the outcome of these meetings became known as 'Tindallgrams' - they became legendary. These memos were always clear, informative and succinct. But their tone was often folksy and humorous, and everybody read them, especially and fortunately senior management, for these memos represented the consensus of all of the many complex elements of Apollo; the manner in which the orchestra would play on concert day, in harmony. Crew procedures. To implement the mission techniques, the spacecraft had to be operated in a manner that would be consistent with the results of the Data Priority decisions - the crew procedures; several volumes of step-by-step and switch-by-switch procedures for each system, each spacecraft and each phase of the mission. Within the command module alone there were 566 switches and circuit breakers as well as 111 event indicators and warning lights. Within the lunar module there were an additional 396 switches and circuit breakers as well as 129 indicators and warning lights. All told, there were 1,202 specific 'functions' that the crew had to understand, evaluate and operate either in primary modes, backup modes, emergency modes, or trouble-shoot to determine the cause of a failure or an anomaly. Procedures had to be developed, integrated, and tested, time and again to ensure that during the flight every action was performed in precisely the correct, and verified, sequence. Procedures were developed and verified during countless hours of simulation and training in mission simulators, procedures trainers, part-task trainers, mock-ups, other representations of actual hardware and software, and even a simulated lunar surface (the 'rock pile'). 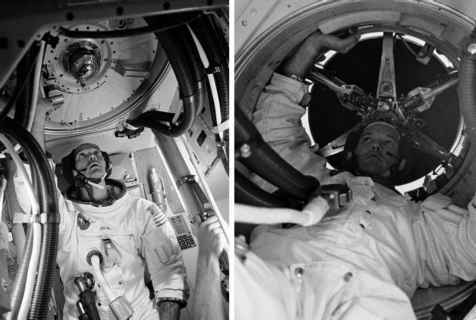 Using these procedures as well as the mission techniques, our crew of Apollo 15 (prime and backup) spent almost 8,500 hours in preparation and training for the mission. Flight plan. The flight plan was developed as a fully integrated time line of events and activities to bring together the mission objectives, the mission techniques, and the crew procedures for each phase of the mission. It served many functions including references to the particular technique to be used, an index to checklists, the equipment to be used, spacecraft system constraints, consumables limitations, specific tasks for each member of the crew, ground tracking coverage, day-night cycles, and even eating and sleeping periods. Alternate and contingency flight plans were also included. As an example, during Apollo 15, an aggregate of 445 pieces of equipment were stowed at launch, each of which had been procedurally integrated into the flight plan. Three months before launch, all the basic documents necessary to conduct an Apollo mission were compiled into a preliminary 'flight data file' - the flight plan, checklists, mission rules, lunar surface procedures, contingency procedures, malfunction procedures, equipment lists, time lines, systems data, G&N dictionary, CSM rescue book, maps, charts, cue cards, etc. This package was distributed to both NASA and contractor personnel - 1,300 copies in all, or a total of nearly 12 tonnes of paper! The spacecraft onboard flight data file, loaded at launch, consisted of 52 of these documents. These documents were then discussed, reviewed, corrected, revised and printed again in their entirety several days before launch. Hardware will come and go. Software will come and go. Astronauts, cosmonauts, and whoever will come and go. But like wheels rolling on roads, and ships floating on the seas, this exceptional book describes the manner in which manned spaceships will fly to the Moon (and return!) for most likely decades to come.